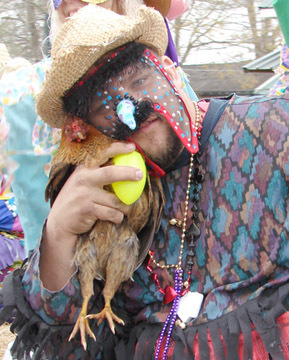 Joe Richard: "Ma Poule (My Chicken)"
"Ma Poule (My Chicken)" is the third in a series of drawings depicting the local celebration of Mardi Gras in Acadania (Southwestern Louisiana). Plans are to do a dozen various images of the people who take part in this annual event. The local Mardi Gras draws large crowds from around the country and swells the population of the small communities by thousands who flock here to Acadiana to see and experience this Prairie Cajun tradition. 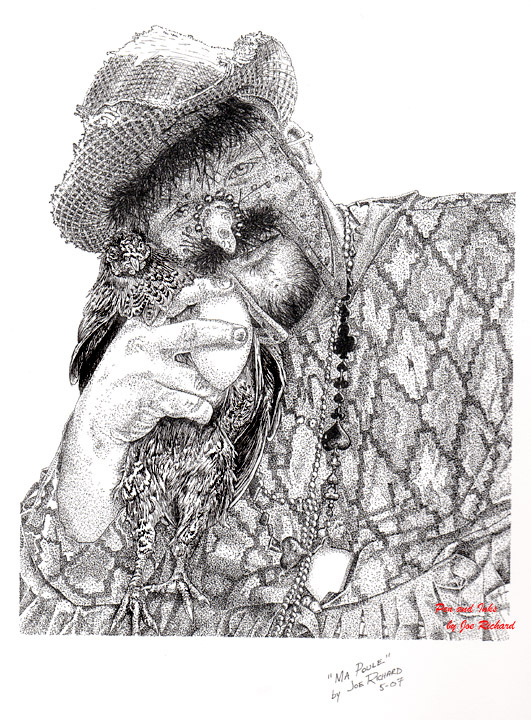 This pen and ink is a rendering of one of a series of images taken by this artist at various daily events leading up to Mardi Gras day 2007. Extensive use of stippling effects combined with some line art was used to create a dramatic finished portrait of "Ma Poule (My Chicken)". The work took approximately 21 hours to complete and measures about 8 1/2 x 11 inches on an 11 x 14 background. The "Ma Poule (My Chicken)" photo used as a guide in completion of this artwork. This photo was taken by this artist on Mardi Gras day, 2007.